The coolest bank ever! Place coin in holder... Addams Family inspired Thing-like hand grabs your coin and it very quickly disappears into the little black box. Really funny! Place a coin in slot… motor grinds as the box starts shaking… slowly a creepy little hand reaches out and quickly grabs the coin… WHOOSH, It’s GONE!!! 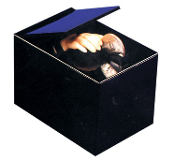 The world’s greediest coin collector snatches your coins and forces you to save them in the black box bank! Official Retro Vintage collectible toy mechanical coin bank is a unique gift and entertaining fun for all ages! Nostalgic reminder of vintage novelty one just like it that we had as kids. Our little grandkids sat quietly taking turns putting over 100 pennies, one at a time, into this box just to watch the fun. *Please use adult supervision under age 6, as there are small pieces from spring-loaded mechanism that could come off by curious little minds! *See Demo of the Black Box Money Trap KB14 or Black Box Novelty Bank on Youtube!!! Made in Taiwan, like the original! Requires 2-‘AA’ batteries, NOT included. Material: Hard Plastic with metal parts and mechanism. (c)1972 Poynter Products, Inc, Cincinnati, Ohio. Made in Taiwan. All patent nos and copy right are for Coin Box Little black Box (c)1978.